Driving up to the stables, based in Belgian countryside, the overriding feeling is that of 'family'. Harrie has been a rider for the Verlooy's since 2002, and it's a warm, bustling yard that has been in the Verlooy family for over 40 years. Part of that family are Axel, Nena and Jos Verlooy, with golden retrievers Bingo and Bongo, all of whom welcomed us into the warmth of the office which looks onto the indoor arena. 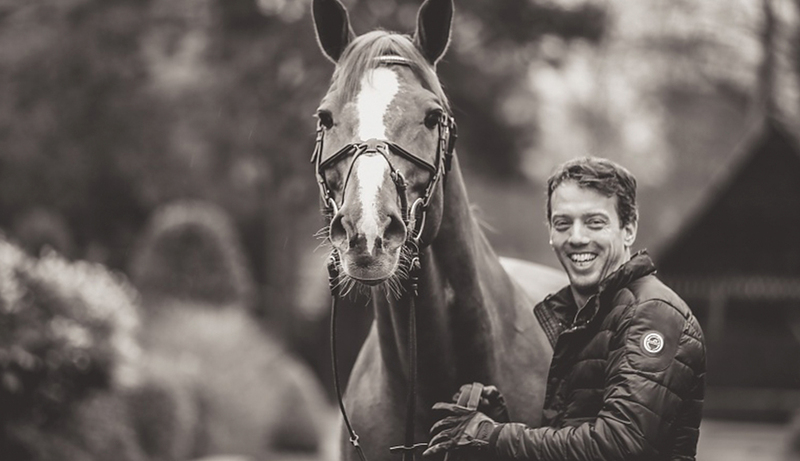 Lined with trophies, medals, paintings and photos of Axel's highest performing horses, the office is the hub of the farm, with comfy leather sofas, an endless supply of coffee and an equal measure of smiles. Walking through the stables, there is a strong sense of authenticity. A 'horses first' ethos is apparent, with every need catered for. “They're treated better than us!” laughs one of the students. Every morning, the horses are ridden out into the forest with miles of Belgian countryside to explore, perfect for strolls or fitness work depending on each individual horse's schedule. In the paddocks outside the famous mare Regina grazes happily. First Harrie had to school Empress, the 7 year old daughter of Emerald who is starting her career in the show jumping scene. “She's talented, but she's sharp; it's about using that to our advantage,” Harrie explains as he throws an exercise sheet over her chestnut quarters, adjusting her bridle slightly before lightly leaping on. Heading to the massive outdoor school it becomes clear Empress is indeed quite a handful, on her toes with fire, spirit and character. But Harrie soon settles her, quietly stretching the chestnut mare, respecting her energy but also gently reiterating his authority. And that's something Harrie is most respected for, his horsemanship. There always seems to be a synergy between the horse and Harrie, and generally the public regard him as someone who is able to get the absolute best out of any horse. Balance is the key word, Harrie agrees: “I think at the end you need to have everything in the right balance. Horses should respect you but they should never be scared. They should be focused but not too fresh when they go in the ring, because they get too distracted – there's probably 100 of those things where you need to be exactly in the middle. There has been plenty of media interest in Harrie's success stories, particularly last year which has undoubtably been the best so far of his career. And many times he's been asked, why? How? What does he attribute this success to? We head back to the solarium, where Alex Tyler-Morris, Harrie's long-time groom and a familiar face on the LGCT and GCL circuit is prepping Emerald for his photoshoot. The head-turning bright chestnut stallion has caused quite a stir on the show jumping scene, creating a fanbase around the world not only for his exceptional results but also his charming looks and presence. We took Emerald outside, where he instantly switched on his model pose, with every camera click growing in height, stature and elegance. On his bridle, a tiny green emerald good luck charm, which catches the light as the chestnut stallion turned his head proudly. We wondered if having a plan like that went deeper, and if it was a reflection to help Harrie mentally, as a sportsman, psychologically. And how it relates to winning. And not only did Harrie take the GCL title with the Diamonds, he made history by becoming the first rider to wrap up the LGCT Champion of Champions win ahead of the final in Doha. “In LGCT, we never expected that I could win the title in Rome. All the others who were just behind me also brought their best horses, so I never considered that we could finish it there. Theoretically we could, but I never expected it. “For LGCT I must also say that Emerald made the title. All the spotlight was on Don, as at every moment he finished the job. But when I was preparing Don for the Europeans, Emerald was 4th in London, he won in Chantilly and he was 6th in Valkenswaard in the LGCT. He made the title in that period.